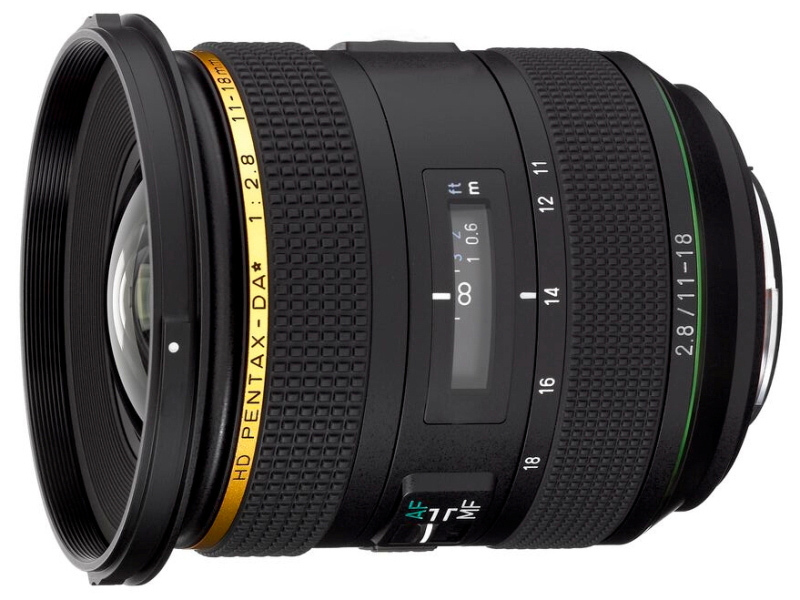 Pentax has announced availability and pricing of the long-awaited 11-18mm f/2.8 lens. Pentax has announced the pricing and availability for the HD Pentax-DA* 11-18mm f/2.8 ED DC AW lens, which was delayed. Set to be available in February 2019 for £1399.99, the lens was originally announced in October 2017, and showcased at The Photography Show 2018, originally to be available last summer. RICOH COMPANY, LTD. and RICOH IMAGING EUROPE S.A.S. are pleased to announce the launch of the HD PENTAX-DA* 11-18mm F2.8 ED DC AW. This high-performance, ultra-wide-angle, Star-series lens features a large F2.8 maximum aperture over the entire zoom range to deliver exceptional optical performance. The HD PENTAX-DA*11-18mm F2.8 ED DC AW ultra-wide-angle zoom lens is the latest model in the new-generation Star (*) series - a lens that provides exceptional image quality to be able to accommodate the super-high-performance digital cameras of the future. It delivers high-resolution, high-contrast images without blurring at the edges, and guarantees excellent imaging performance in high-grade digital photography. With the introduction of this lens, the high quality, high-performance Star series now provides a wide angle-of-view coverage - from ultra-wide angle to telephoto compact models featuring a large f/2.8 maximum aperture, exclusively designed for use with PENTAX APS-C-format digital SLR cameras. Also announced today is the HD Pentax FA 35mm f/2. I'll put the bunting out. An interesting offering for us APS-C shooters. At the price it really is going to have to excel, I certainly will not want to be reading about decentred examples in the reviews when they come out. The focusing needs to be snappier and more reliable long term than the older SDM DA* lenses also. Pentax being innovative again with electrical warming which looks brilliant, and a loud signal that Pentax still invests in APS-C. This lens looks great and we all know that Pentax lenses are truly wonderful lenses for sure; however why can’t they spend money and time on giving us decent hi-speed autofocus, tracking and buffering so we can better use the lenses for action, wildlife and other forms of high speed photography, whatever it may be. Just one body that can handle birds in flight for example or high speed sport is all that is needed. There’s always rumours about the precarious position of the Pentax brand but in my view it is not about lens quality; we are simply not able to compete against Nikon (in particular) and Canon when it comes to action and wild life photography. I have bought a 2nd hand Nikon D 500 just for birding but I wish I could have bought a Pentax with the same capability to track and buffer high speed continuous shooting so I could use my big Pentax lenses on BIF and other fast moving wild life. The Nikon D500 is a medium priced APS DSLR not a horrendously expensive hi-tech marvel. Having used it for a couple of months I am quite sad I bought the entire Pentax FF range of lenses and two bodies ovet the last three years . I feel I can’t go on clinging to the hope we will get a Pentax that could just keep up with even this modest Nikon in the field. I can ‘t see it happening and for wildlife I see Pentax are going so far behind it will really accelerate their demlse which will be a very sad day for me. I beleive this is a hole they should fill before we get anymore lenses. I for one want to keep this brand and it’s wonderful glass alive going forward into the long term future. Wake up Pentax the gap is getting widrr and wider. PLEASE PENTAX, READ THE ABOVE! Nikon spammer alert Also off topic.